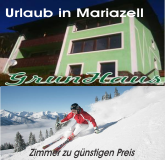 Fun in the snow for the whole family is the motto of the Mariazeller Bürgeralpe. You can choose from eight slopes with a total of 11 km (6.8 miles) of trails and a level of difficulty for everyone. The perfect place for beginners and children, athletically ambitious skiers can find just the challenge they are looking for on slopes that have been tested and awarded with the Slopes of Styria Seal of Approval. An effortless ascent is yours in a gondola lift, on two four-seat chair lifts, a T-bar tow lift and a button lift. The Kids’ Skiing Land has a magic carpet and a rope lift and there is a fun park just for snowboarders, too. And if you’d like a little change of pace from skiing or snowboarding, we recommend a ride on our new 1700 meter (1 mile) long toboggan run that ends near the lower terminus of the aerial tramway. Take the aerial tramway up the mountain and toboggan on down to the valley, that’s just good old-fashioned fun for young and old. Because of lighting, you can enjoy the toboggan run in the evenings, too. There’s also plenty to eat and drink on the mountain. Just stop in for aprés ski at the mountain inn Berggasthof Bürgeralpe and the cottage Edelweißhütte and on the valley run in St. Sebastian at the cottages Mitzis Rindenhütte and Bartelbauerhütte.